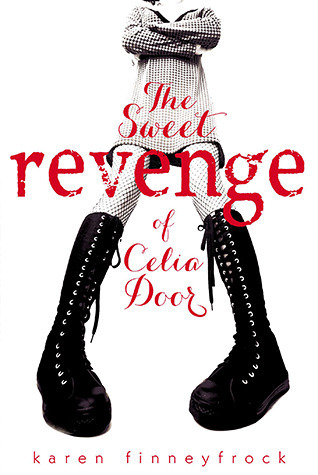 The Sweet Revenge of Celia Door by Karen Finneyfrock. Viking, 2013. Currently Available. Face Value: How much do I love this cover? So. Much. It’s both interesting artwork and actually relevant to the book’s content. The boots are perfect, Celia looks appropriately fierce and the use of perspective gives her and her story a larger than life quality. Normally I would shake my fist at the headless model but this looks so intentional, as though the image is actually an artistic choice instead of a stock photo, I can’t find myself bothered by it. Does it Break the Slate? Definitely. Celia is a Slatebreaker – frankly, I wouldn’t put the literal act past her if given the right circumstances, but she’s also very much a character who is taking her situation into her own hands. She has a whole lot of terrible things to deal with, and she handles them with a remarkable finesse, and a ton of inner strength, while still being a fascinating/flawed character. Who would we give it to? Definitely add this title to your anti-bullying curriculum. It’s a fresh, non-cloying perspective, and it’s an important voice to add into the mix. Any budding poets will find a lot to like here as well. Review: Celia Door is starting her ninth grade year as Celia the Dark. She became Celia the Dark at the end of eighth grade, right before her 14th birthday, when the despicable Sandy Firestone did something unspeakable to her. With her boots, eyeliner, tights, and hoodie, Celia is making herself impenetrable as she starts high school. Celia the Dark is not seeking friendship, or popularity, or acceptance. Celia the Dark is seeking revenge. But when she does find a friend, in Drake, the new boy at her school, she finds herself caught between her revenge and her new friendship. Ultimately though, the conflict of the book isn’t about Celia making this decision – it’s about her finding a way to get through the terrible things that have been done to her, and coming out stronger on the other side. She’s also given us a wonderful character in Celia, who never lets herself be a victim, even when she is faced with bullying that has what seems like no way out. Celia is not just tough when she is Celia the Dark (although I love the unflinching fierceness of that persona). I love that she’s out for revenge, that she wants to make justice happen for herself. Even if that revenge is not necessarily a “good” thing to do, or the right thing to do, or even a particularly Slatebreaking thing to do, what is Slatebreaking about it is that she allows herself her anger and wants to do something about it. No passive victimization here – She is tough at her core, and I think that empathizing with her would give a reader going through something similarly horrible a real sense of power and hope. Not only do I totally relate, I love the sentiment. And I love the idea of taking power from the library, or from whatever space it is that gives you that recharge. Sometimes finding that is what you need to get through the day, or the week, or whatever terrible thing is happening, until you can move onto the next thing. It’s no secret that the girl-centered bullying that we see in this novel is a hot topic in recent years. Finneyfrock doesn’t shy away from how cruel this bullying can be, or offer a magical solution. But she offers a poignantly realized perspective on one girl’s way out. I loved this ferocious novel and character, and I look forward to reading more of Karen Finneyfrock’s work. This entry was posted in Reviews, Young Adult and tagged Bullying, Friendship, LGBTQ, Poetry, revenge. Bookmark the permalink.